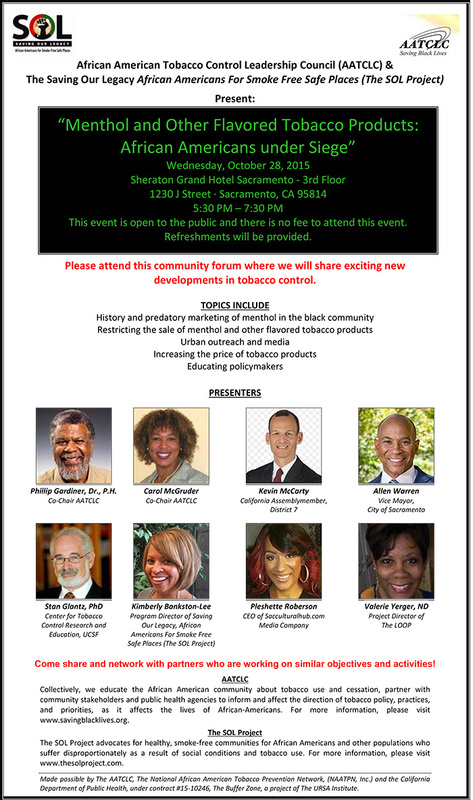 ATTN: All residents of the Greater Sacramento Valley Region and beyond interested in eliminating the sale and distribution of tobacco to African American youth and young adults. Join The African American Tobacco Control Leadership Council (AATCLC) and Saving Our Legacy, African Americans For Smoke Free Safe Places (The SOL Project) for a special community forum titled “Menthol and Other Flavored Tobacco Products: African Americans under Siege”. This informative discussion will take place on Wed-10/28 from 5:30 pm to 7:30 pm at the Sheraton Grand Hotel, 1230 J Street – 3rd Floor in Sacramento. There is no fee to attend this event. Guest presenters including Assemblymember Kevin Michael McCarty and Vice Mayor Allen Warren; will discuss history and predatory marketing of menthol in the black community; restricting the sale of menthol and other flavored tobacco products; Urban outreach and media; increasing the price of tobacco products and; educating policymakers.